Her first lesson in mortality came early. When Spark was around nine years old, her grandmother Adelaide came to live in Edinburgh and was installed in Spark’s own bedroom. Adelaide’s past was somewhat mysterious, but she was feisty and fun. A former suffragette and an excellent storyteller, she styled herself as a ‘Gentile Jewess’, an identity Spark would later claim, as well as using it in the title of one of her most famous short stories. After a couple of years, two strokes, and a cerebral haemorrhage, Adelaide required care. The young Muriel helped provide it, realising in the process how vulnerable old people can be, as well as how fascinating she found both Adelaide’s aphasic peregrinations of memory and language and the implication that the Grim Reaper might be just around the corner. In her memoir, Curriculum Vitae, Spark notes that ‘my experiences in minding and watching my grandmother formed a starting-point for my future novel, Memento Mori, in which the characters are all elderly people’. John Masefield once told her that ‘all experience is good for an artist’, and she was always refreshingly pragmatic about the matter of life offering up material. Little surprise that readers tend to find particular fictions, ‘The Gentile Jewesses’ amongst them, more amenable to an autobiographical reading than the ostensible autobiography. Few members of the coterie of characters centring on Jean and eighty-five-year-old Charmian are so clear-sighted. The ability to acknowledge one’s own mortality without dismay is reserved for those who are Catholic; both women are, like Spark herself, converts. When, at the beginning of the novel, Charmian’s eighty-seven-year-old husband Godfrey hears that his sister Lettie has once more been victimised by the anonymous caller exhorting her to ‘Remember you must die’, he surmises: ‘He must be a maniac.’ Dame Lettie herself considers it ‘a great pity that flogging has been abolished’. Godfrey is much concerned with ‘faculties’ and their retention, and scornful of his wife’s erratically failing memory. Always ‘perfectly sensible’ when discussing her books, Charmian retains her novelist’s insight. She realises that her dementia has been the excuse Godfrey needed to take his revenge: ‘It was an instinctive reaction to the years of being a talented, celebrated woman’s husband, knowing himself to be reaping continually in her a harvest which he had not sown.’ As interest in her novels revives, Charmian’s brain sharpens and her physical health improves. ‘Godfrey, after all, was not a clever man,’ she muses, while plotting her escape from her husband and his bullying new housekeeper, Mrs Pettigrew, who wish to exert upon her ‘a firm hand’. Trust and betrayal are key themes here, as they remain in The Prime of Miss Jean Brodie, published just two years later. Whereas we’re told that many of Charmian’s novels consisted of people saying ‘touché’ to each other, Spark is known for the sharpness of her style. The narrator of Memento Mori is rovingly omniscient, and wonderfully tough, a voice capable of observing Godfrey Colston standing there ‘arms dangling and legs apart, like a stage rustic’ as well as noting the way a visitor to Jean Taylor looks carefully at her eyes to determine ‘a continuing intelligence amongst the ruins’. Old age is full of indignities, and Spark’s characters are spared none of them. Jean Taylor, a woman ‘practised in restraint’, embraces the ‘desolate humiliation’ of the microcosm that is the Maud Long Ward as God’s will. She ‘did not hesitate, on one occasion when the nurse was dilatory, to wet the bed as the other grannies did so frequently’. The true horror to be feared is loss of control, and the loss of one’s identity that accompanies it. For the poet Guy Leet, this lies in the prospect of the physical incapacity to write. Looking ‘reproachfully’ at his hands, he decides they might be ‘good for perhaps another year’ in spite of the twisted fingers. ‘How primitive, Guy thought, life becomes in old age, when one may be surrounded by familiar comforts and yet more vulnerable to the action of nature than any young explorer at the Pole.’ The triumph of the writing is that Spark creates just enough space (and no more) for the dawning of empathy. The physical jeopardy of old age creates palpable tension, the young’s lack of comprehension or active contempt for the old is lacerating, and when actual violence comes, it shocks us to our core. When the novel first appeared, it marked a pivotal point in Spark’s career. Her admirers Graham Greene and Evelyn Waugh loved it. It remained Greene’s favourite of all her novels, and Waugh thought it ‘singularly gruesome’. Tremendous critical success followed, in the UK at least (the US took slightly longer to warm to her talents). V.S. Naipaul reviewed it as ‘brilliant, startling and original’. Not bad for a work that Macmillan refused to contract until the manuscript was complete, and a vindication of Spark’s insistence that she would not welcome editorial input. She was forty-one years old, and at last earning enough from her writing to survive comfortably (and, indeed, to buy herself a diamond ring). She had published three novels within three years, and the advance for her next, The Ballad of Peckham Rye, doubled. It would soon be time to think of matters such as public image, and the ideal conditions for the continued production of art. Across such a glittering oeuvre as Spark’s, Memento Mori continues to stand out for the contemporary reader. Its structure and tone are pitch perfect, and it has an uncanny knack for making us laugh while making us think. The two central female characters are wise, loveable and deeply memorable, if that is we are to be allowed to retain our memories. At the same time as being absolutely specific and of its period, it is universal. For what could be more timeless, more perennially disruptive to our psyches, and more consoling than the counsel given by the anonymous caller throughout Memento Mori? And how would each of us answer, if we took the call and were told to remember we must die? This essay is the introduction to the new edition of Memento Mori, published in November 2017 by Polygon. 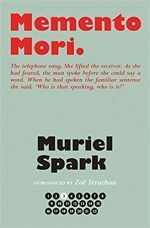 The Centenary Edition of the novels of Muriel Spark is edited by Alan Taylor and published 2017-2018 (22 volumes, £9.99 each, hardback). Zoë Strachan is an award-winning novelist, short story writer and librettist who sometimes dabbles in non-fiction and drama. The Prime of Miss Jean Brodie was the first novel by a woman writer from Scotland that she read, and it engendered a lifelong passion that has led her to write several articles on Spark’s life and work.